An Amish man shared a new vegetable with us a few years ago. We were at a farmer’s market appreciating the colorful selection of peppers and tomatoes when we came across something we had never seen. Paper sheaths the husk tomatoes. This new fruit was like a small Chinese paper lantern with a very small yellow tomato inside. The little round fruit is like a tomato about the size of a large pea. Just pull back the edges of the papery shell and eat the fruit or pluck it off the stem. Put the paper sheath and stem in your compost bin. Peel back the paper husk to reveal the tiny yellow tomato. The yellow fruits on the left are ready to eat, but the greenish ones on the right should get a little riper first. 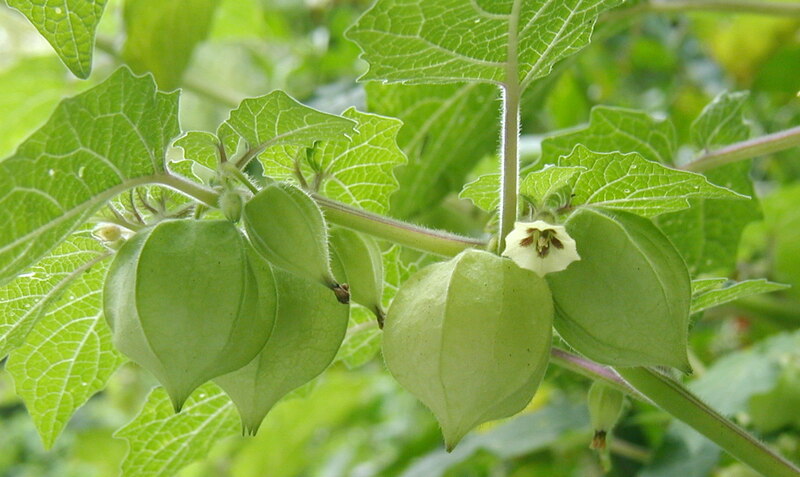 Ground cherry is the right name for these little fruits because the taste is surprisingly sweet. They’re sweet enough that the little yellow fruits are often used to make jams, jellies and pies. 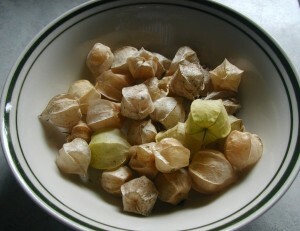 Ground Cherries are also called Husk-Tomatoes. We bought a couple of plants a few years ago for the garden. They’ve dropped seeds every year since and come back to produce an abundance of fruit. It’s important to have more than one plant for fruit production, so make sure that you grow two or more plants. The individual plants don’t self-fertilize so with only one plant there is little hope of fruiting. Husk tomatoes on the vine. Note the single flower, the outline of the leaves, and the green color of the paper shell. Close-up showing the husk tomato paper sheath, light-colored bell-shaped flower with a dark center, and overall fuzziness of the plant. 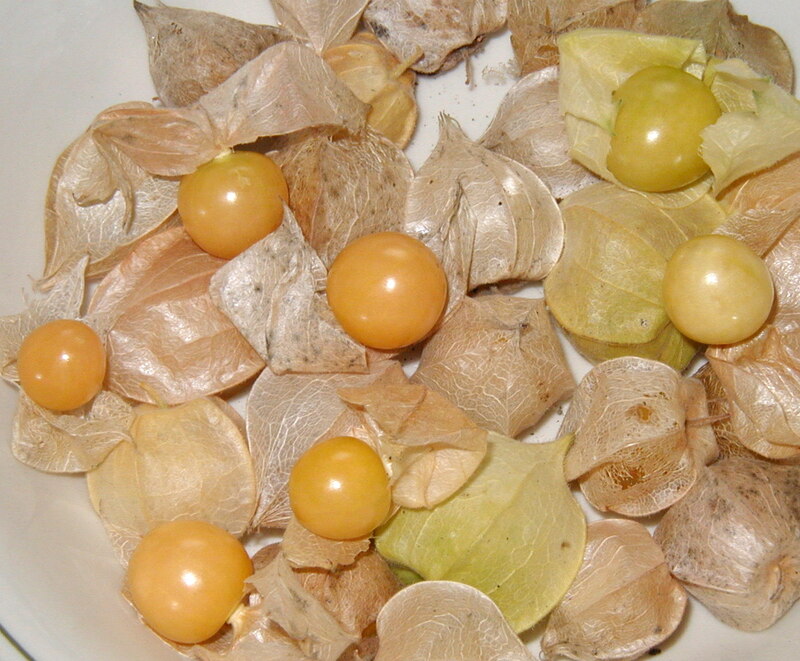 Our variety is an Amish heirloom type that was simply labeled as ground cherry (husk tomato). 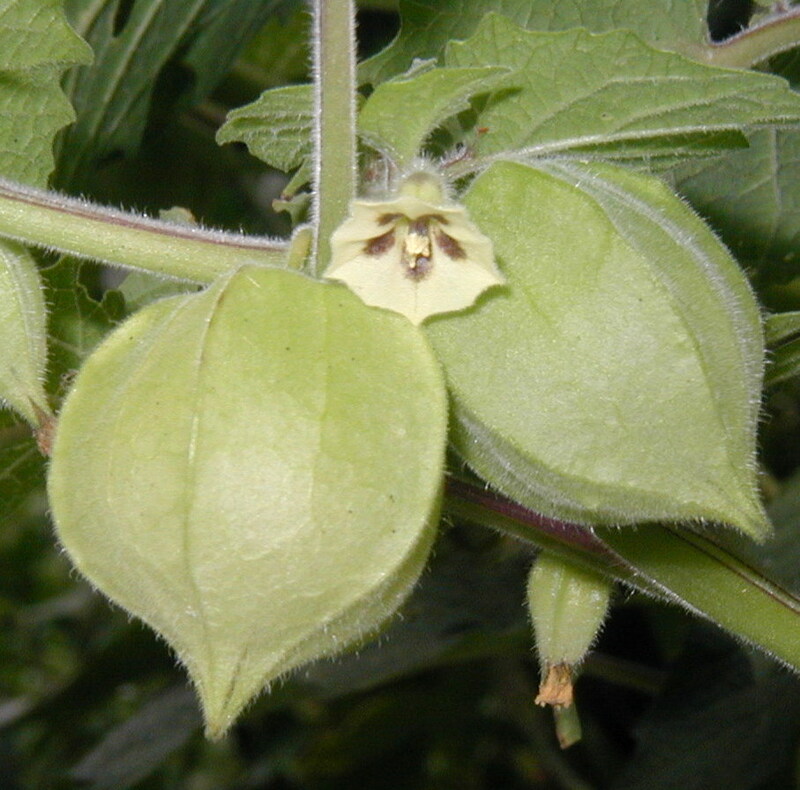 There are over a dozen species of Physalis native to Northeast USA, so it’s hard to say exactly which species we have. It may be the Strawberry-Tomato, Physalis pruinosa, judging by the leaf shape with scalloped edges and a heart-shaped base, and mature fruit that is yellow. Other varieties include ones that have more or less downy or hairy stems and fruit that may be reddish or purple in color in addition to the yellow that ours gives. Take caution: the green unripe fruit is poisonous. Leaves are scalloped with irregular teeth and often have a heart-shaped based, but not always. 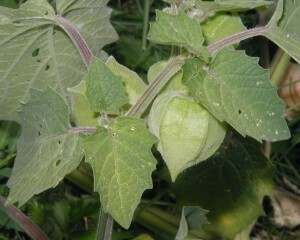 Stem ribbing is purple and the leaves are a lighter green on the underside. The plant will often drop fruit before it’s ripe, but the fruit will ripen on the ground inside its protective husk. The paper husk turns from green to yellow to tan as the fruit ripens. Sometimes you’ll see the paper of the husk getting thin, but the fruit will have been protected for many days and most likely still fine to eat. If left too long, the insects will find it or the seeds will re-emerge as next season’s plants. In central Pennsylvania we get to enjoy the harvest of husk tomatoes from August through September and part of October until the frost comes. 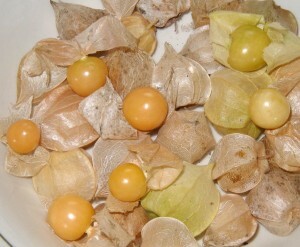 If anyone wants some husk tomato seeds or ground cherry seeds, we have some to exchange or via paypal. Contact wilde at wildeherb dot com. 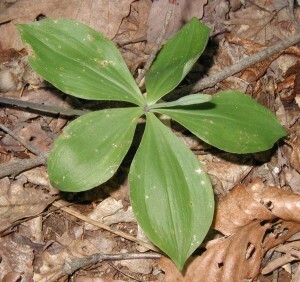 Very few Whorled Pogonia plants flowered in 2010, but of the four individuals that did only two appeared to have been fertilized as noted by the developing seed heads. 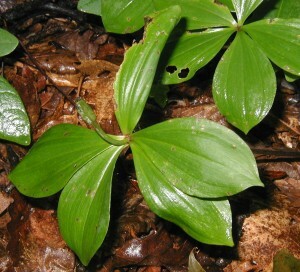 Whorled pogonia may only spread successfully by their root system, judging by the sparse seed output this year and total lack of flower production in prior years. 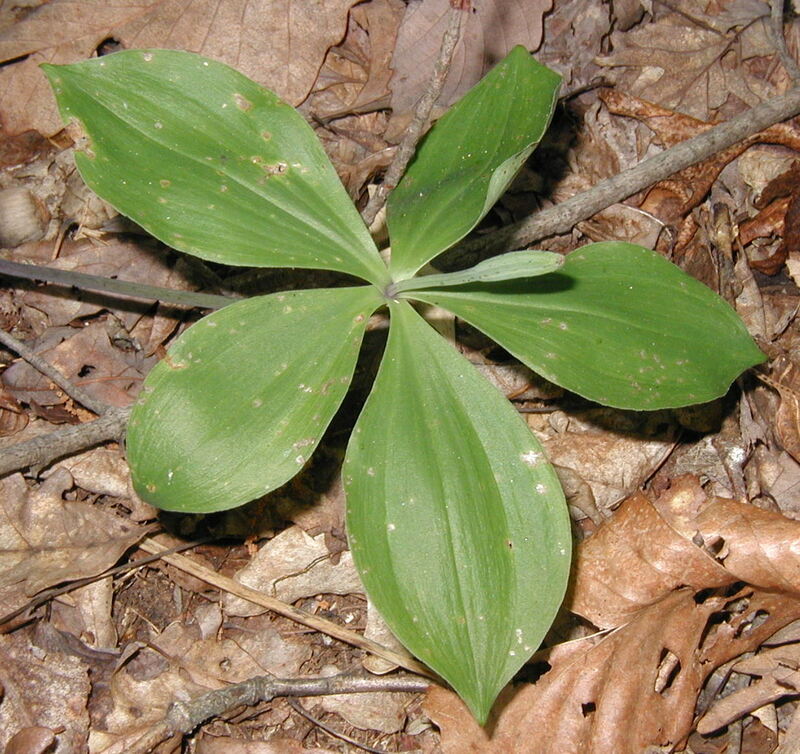 Would that mean that the flowers of whorled pogonia are self-fertile, like those of the Box Huckleberry of Pennsylvania? Large whorled pogonia plant with seed head. Photo above taken 31 May 2010. Another specimen of Whorled Pogonia with seeds developing. Photo above taken 16 June 2010. Although not federally endangered like its cousin the Small Whorled Pogonia, Isotria medeoloides, Whorled Pogonia, I. verticillata, is listed for protection in a handful of states. New York lists this orchid as vulnerable, Vermont and Michigan list it as threatened, New Hampshire, Illinois and Florida list it as endangered, and Maine lists it as possibly extirpated. Evidently, the Large Whorled Pogonia is being squeezed at the extremes of its natural range, possibly due to habitat loss.